and ID cards, concert recording and live-streaming, and accompanist services. For complete lesson descriptions and fees, see Lessons. Tuition for classes and ensembles is listed in each individual course description. The listed tuition is per 17-week semester or 10-week session and will be reassessed each semester. Any single class or ensemble is 10% off with concurrent registration in private lessons. Two or more concurrent 17-week classes or ensembles are 15% off with concurrent enrollment in private lessons. Students enrolled in private lessons receive an additional 25% off Fundamental Musicianship Classes (a value of approximately $100 off! ), including Dalcroze, Theory and Aural Skills 1, and Aural Skills 2. For multiple students residing in the same household, ECMS will waive registration fees for the second and subsequent student(s). Students must indicate family members’ names on the registration form or, send an email to community@esm.rochester.edu. University of Rochester employees and their dependent children may be eligible to receive a 25% tuition waiver off ECMS tuition. Tuition waivers are good for one year from July 1-June 30, and must be renewed annually. For complete details, please consult the University of Rochester Benefits webpage. The Benefits office makes all determinations regarding eligibility. Elementary musicianship classes are free for Eastman Young Children’s Chorus and Eastman Children’s Chorus members in grades 2-8. These classes are conveniently scheduled back-to-back, with teachers leading students between the classes on the “chorus train.” Students in Children’s Chorus who complete all levels of Elementary Musicianship may go on to take Fundamental Musicianship: Dalcroze and Fundamental Musicianship I free of charge. Those registered in a core ensemble receive a 25% discount on all other New Horizons Ensembles. Core ensembles include Green Band, Intermediate & Advanced Band, Beginning Strings, Full Orchestra, Advanced String Orchestra, Chorus, Big Band, and Vintage Jazz Band. New Horizons tuition is FREE for those who are 90 or older. Snowbird Policy: New Horizons members who are gone four or more consecutive months during the winter are asked to notify the ECMS office by December, and they will be billed for the fall semester only. All are welcome to attend rehearsals for the balance of the school year at no additional charge when they return. Click here for complete policy details. 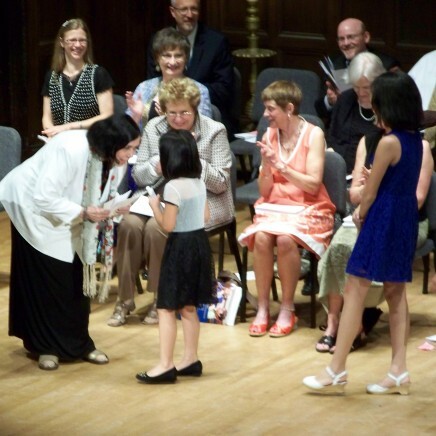 The Eastman Community Music School is fortunate to be able to offer scholarships taking into account both merit and need. 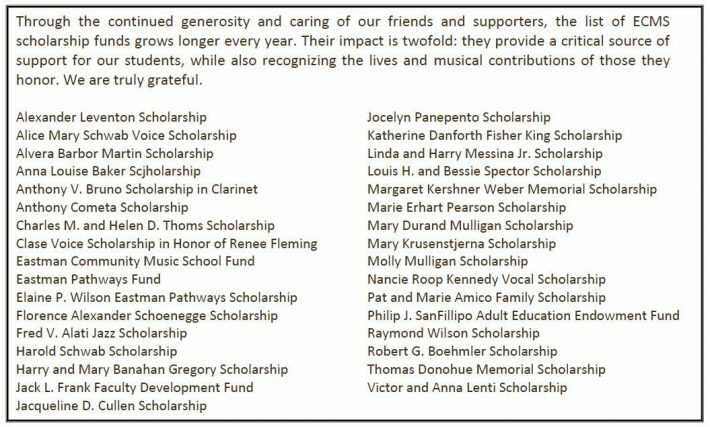 The school has named scholarships, which are targeted to specific instruments or voice as well as a general scholarship fund open to all students. Current students who excel in their study at ECMS may receive a Merit Scholarship at ECMS graduation for study the following school year. Recipients are chosen from those recommended by their ECMS teachers. No application is needed. Financial assistance for regular academic year study is available to ECMS students for lessons, classes and ensembles. Preference is given to those students enrolled in a diploma program. Assistance is awarded on the combined basis of financial need (determined by review of page 1 of federal income tax return) and merit (demonstrated musical achievement or potential). Applications are accepted on a continuing basis throughout the year, but awards are determined only two times each year based on the following deadlines: August 1 (consideration for the coming school year) and December 1 (consideration for the spring semester). Requests will be considered after December 1, if funds remain. We are fortunate to have a scholarship program targeted to students in the Rochester City School District called the Eastman-Pathways Scholarship. The Eastman-Pathways scholarship is a collaborative program with the Rochester City School District which enables approximately 70 students to attend Eastman for applied and classroom studies. We are also fortunate to have a scholarship targeted to students in Wayne County called the Boehmler Scholarship. Students from Sodus, Lyons and Pal-Mac School Districts are selected by their public school teachers. Scholarship awards may be used for any lessons, classes or ensembles at ECMS.